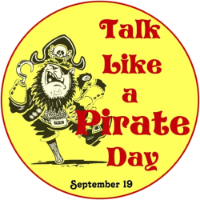 In honor of Talk Like A Pirate Day (which is today, in case you didn’t know) we go back a couple of years to The RFC MINI SHOW number three and a visit with The Dread Crew of Oddwood. Just for kicks, we’re also bringing you a bonus clip we made that year just for this special day. Look for new music from The Dread Crew coming up on Radio Free Charleston in the near future.